Motorcade/FlashParade is launching Blueprint, a new open call for aspiring curators to support and encourage new curatorial voices wishing to exchange ideas on contemporary practice and engage audiences with fresh perspectives. We invite passionate and ambitious emerging curators to submit exhibition proposals for our 1000 square foot space, for 2 group shows taking place in June and July 2012. Blueprint is supported by the National Lottery through Arts Council England SELECTION PANEL 2012's Blueprint competition will be selected by: Ruth Claxton (Artist and Associate Director, Eastside Projects, Birmingham) Gordon Dalton (Artist, Curator, Mermaid & Monster, Cardiff) Paul O'Neill (curator, artist, writer, Bristol). 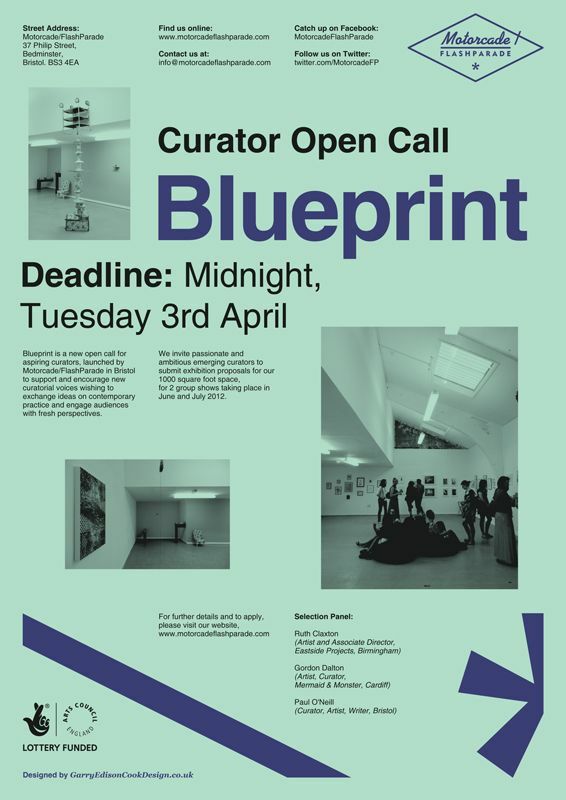 IMPORTANT DATES Application Deadline: Midnight, Tuesday 3rd April ELIGIBILITY Blueprint is open to emerging artists and curators based in the south west and Wales. Current MA students and 3rd year BA students (degrees relating to fine art or curating) based in these areas are also eligible to apply.